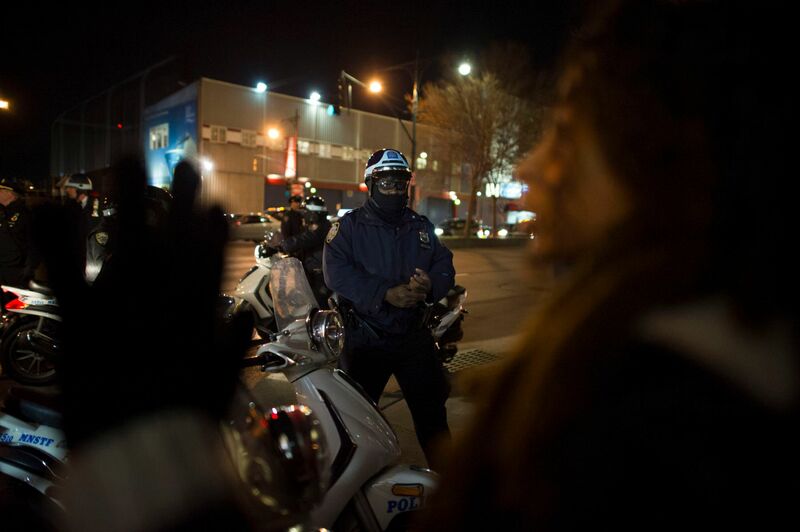 12/04/2014: At the intersection of 17th street and the West Side Highway, protesters peacefully clashed with police officers who amassed to keep people from blocking traffic. After a tense couple of minutes the protesters turned around and headed up 7th ave instead. 130 Stuvyson, Staten Island, NY. 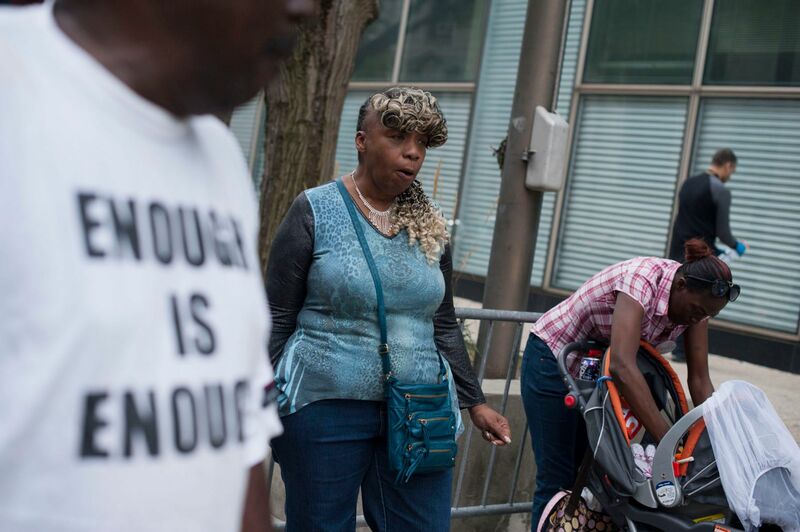 9/29/2014: As a Grand Jury got underway in Staten Island to decide whether or not the police officer responsible for Eric Garner's death would be charged, Eric Garner's Mother, Gwen Carr (center) stood outside the Supreme Court chanting for justice. 12/04/2014: Protesters squared off against police officers on 17th Ave and The West Side Highway a day after a Grand Jury decided not to indict the officer who killed Mr. Garner with an illegal chokehold. 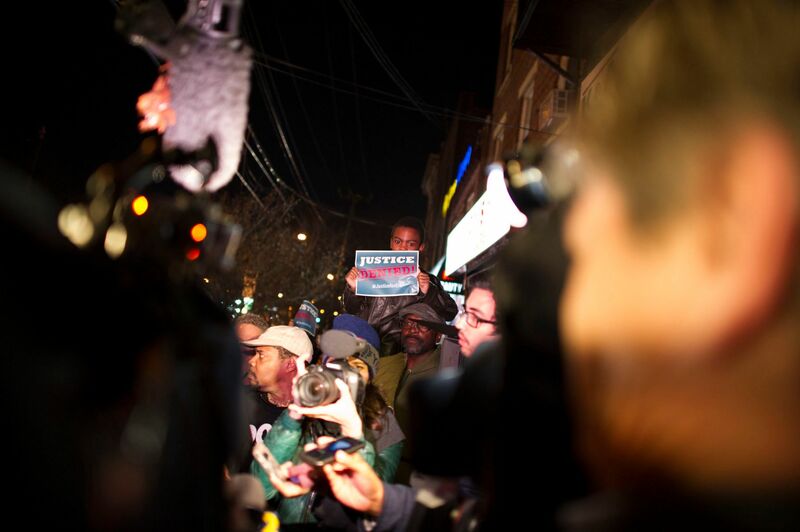 12/03/2014: Residents of Staten Island gathered in front of a memorial on Bay Street where Eric Garner was killed after hearing that a Grand Jury would not indict the Police officer that had killed Mr. Garner. 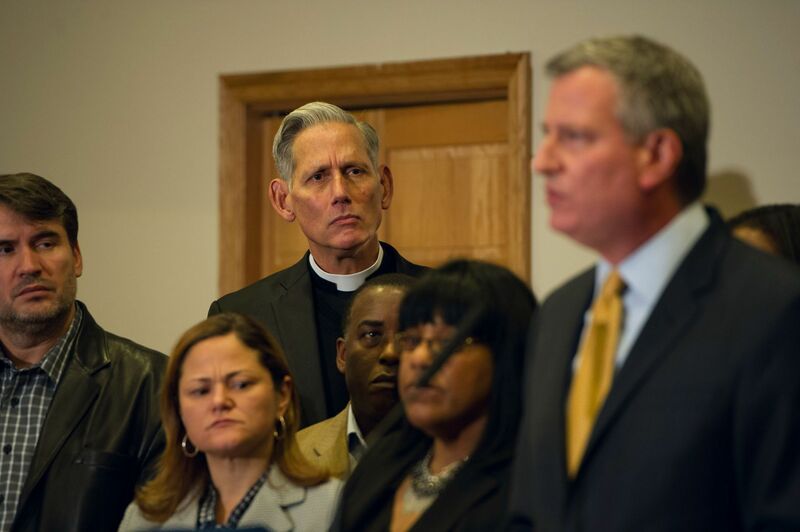 12/03/2014: A preist from the Staten Island Community listened intently to New York City Mayor, Bill De Blasio (right) as he talked about the decision by the Grand Jury not to indict the officer who had killed Eric Garner with a chock hold. 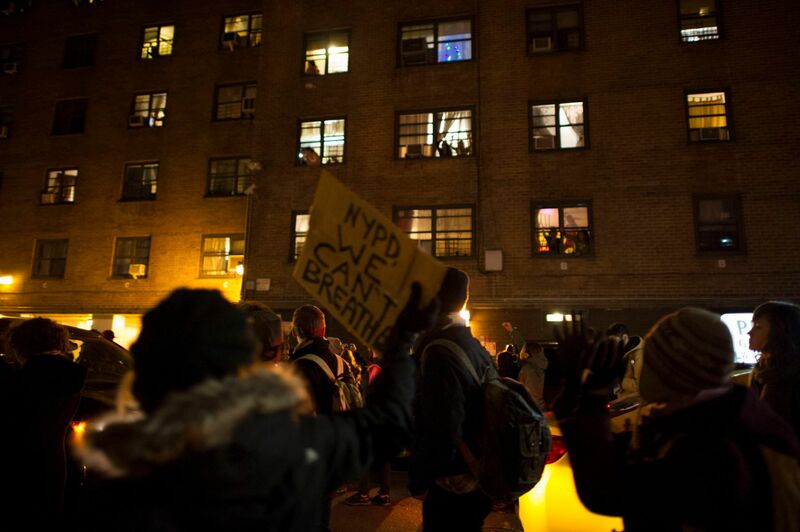 12/04/2014: Protesters marching against the decision to not indict the Police Officer who killed Eric Garner with an illegal choke hold marchered across 17th street in Manhattan while people from the surrounding buildings cheered them on. 12/04/2014: Protesters marched up 7th ave towards Times Square chanting, "Justice for Eric Garner!" and, "No justice, no peace." By the time they had reached Times Square over a dozen protesters had been arrested. 12/03/2014: Outside Mt. Sinai Church in Staten Island, two protesters held signs, meant for Mayor Bill De Blasio. The Mayor gave a long speach at Mt. Sinai directly after the Grand Jury Decision, call for peaceful and meaningful protests. 12/03/2014: New York City Mayor, Bill De Blasio spoke at Mt. Sinai Church in Staten Island after the Grand Jury decision came back to not indict the Police Officer who killed had Eric Garner with an illegal chokehold over the summer. 12/04/2014: A protester in Times Square was arrested for obstructing traffic and resisting arrest. 12/03/2014: In Staten Island, people gathered around the Eric Garner Memorial on Bay Street, where Mr Garner was killed. Those who gathered were angry and confused, but the people on Staten seemed to be in a state of more somber reflection, focusing on Mr. Garner and the future without him. 12/04/2014: Tensions ran high near Times Square in NYC. Police officers arrested over a dozen protesters around 10pm while the crossed 7th Ave and 42nd St.
12/03/2014: A paper sign calling for Justice hung above the Eric Garner memorial on Bay Street in Staten Island. People gathered around the sight somberly, after hearing that a grand jury decided not to indict the officer who had killed Mr. Garner with an illegal choke hold. 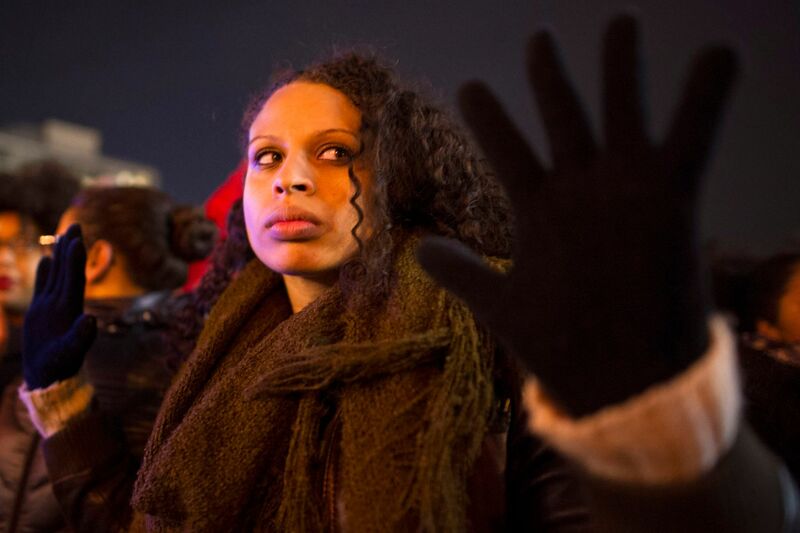 12/03/2014: Whlle protesters marchered throughout New York City after hearing the decision from the Grand Jury, family and friends gathered around Eric Garners memorial on Bay Street in Staten Island. Although many were agnry and confused everyone pushed for peaceful relfection rather than violence. 12/03/2014: New York City Public Advocate, Letitia A. "Tish" James paid her respects at Eric Garners memorial on Bay Ave in Staten Island after giving a speach in reaction to the Grand Jury's decision not to indict the Poilce Officer who killed Mr. Garner with an illegal chokehold. 12/04/2014: Police Officers rallied in force in Times Square in preperation of protesters who were heading North on 7th Ave.
12/04/2014: In Times Square protesters rallied around the Police Station, chating for Justice while holding their hands up in solidarity with Michael Brown, the teengager killed by a Police Officer in Fereguson, MI.